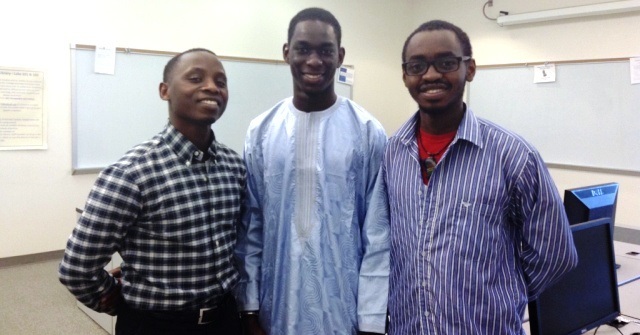 Pictured above (from left) is Joseph Munyambanza ’15, Moussa Sall ’15, and Steven Sakayroun ’16. Three Westminster students will head to Uganda this summer to launch a new initiative for peace through education, thanks to Projects for Peace. This year, Steven Sakayroun ’16, Joseph Munyambanza ’15, and Moussa Sall ’15, were selected to have their project, Rethinking Education: Bringing Online Education to Disadvantaged Communities, funded by the Projects for Peace program. Westminster students are able to apply for a Projects for Peace grant because of the College’s affiliation with the Davis United World Scholars Program. Thanks to this generous funding, Westminster students have had the opportunity to travel and perform service projects in places all over the world including Rwanda, Ethiopia, and Nepal. What is Projects for Peace? An initiative for all students at the Davis United World College Scholars Program partner schools to design grassroots projects – anywhere in the world – which promote peace and address the root causes of conflict among parties. The Davis UWC Program encourages applicants to use their creativity to design projects and employ innovative techniques for engaging project participants in ways that focus on conflict resolution, reconciliation, building understanding and breaking down barriers which cause conflict, and finding solutions for resolving conflict and maintaining peace. Through a competition on over 90 campuses, projects will be selected for funding at $10,000 each. The goal of Rethinking Education is to provide quality online education to local communities in Hoima, Uganda. The project will consist of creating a computer lab, providing that lab with fast internet access, and training young students on how to use massive open online courses (MOOCs) such as Coursera, Khan Academy, and more for education. The group will be implementing their project this June and July. Westminster College wishes them the best of luck in making a difference in the lives of others this summer in Uganda. Students interested in applying to Projects for Peace can click here. Read about the 2013 Projects for Peace initiative by Westminster students.